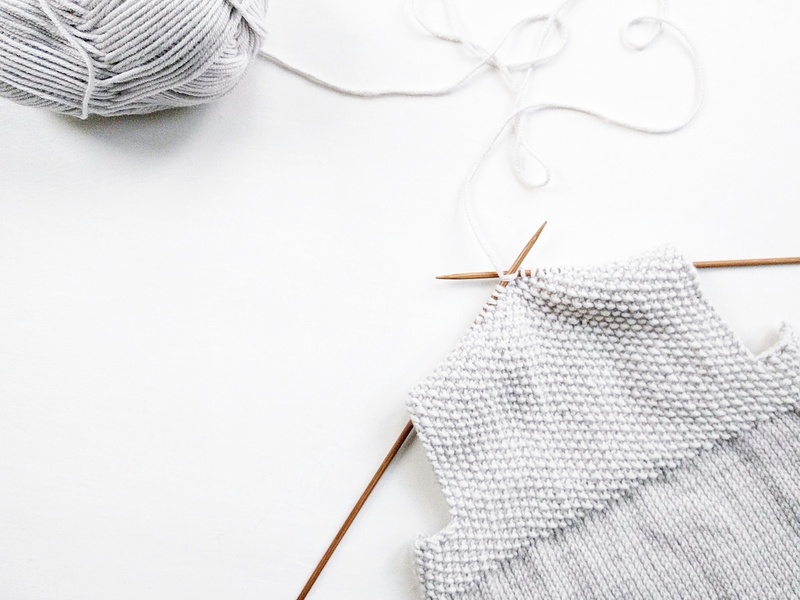 I bookmarked some time one afternoon to take a thorough look through my knitting stitch directory. It’s something I’ve flicked through on multiple occasions, but I wanted to give it a really detailed read and pick out my favourite stitches. I’ve got a thing going on with texture at the moment, so I’m planning to experiment with some swatches and let the inspiration flow! My first attempt was to try crossed stitch, and I was immediately in love. It’s the perfect balance of interest and uniformity and I couldn’t wait to put it into action on a new pattern design. Which leads me nicely onto my first pattern for a while… I designed a few over the winter, but it’s something I’ve been far too lax about lately and I need to give it some more time and attention! I paired my recently learned crossed stitch with my newly acquired jersey yarn and, after a whole lot of trial and error, came up with this cute little festival bag. 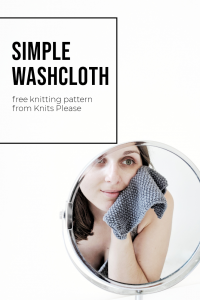 I’m just finalising all of the pattern details and hope to be able to launch it in the next couple of weeks! Sticking with the theme of FOs, I’ve got a couple to share from June, both of which I really enjoyed knitting. The first is another pair of the baby dungarees I knit a few months back, again in Debbie Bliss Baby Cashmerino in Silver. I don’t know what it is about these adorable little things, but I absolutely love the process of knitting them. 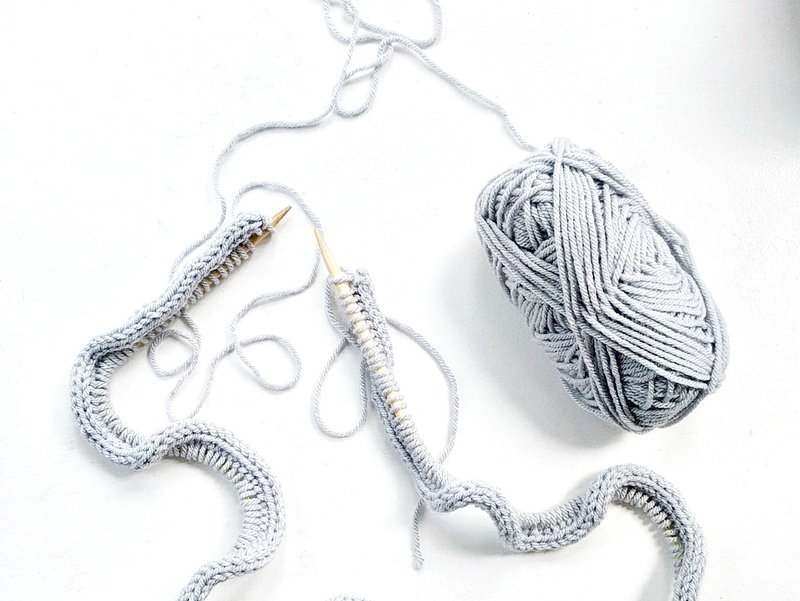 And that seed stitch…all the heart eyes! My second FO was the second vest I worked up in the Debbie Bliss Cotton Denim DK I picked up on a recent trip to Leeds. It was another improvised design, incorporating an i-cord (my not-so-new favourite thing! ), and I was so pleased with how it turned out. The shaping is just what I’d hoped to achieve, and the fit is pretty close – if anything I’d make the body an inch longer for a little more coverage, but it’s perfect for the super hot days we were having in the UK this month! Moving onto WIPs, and there’s a big one that’s going to be around for a while! It’s been a figment of my imagination for months now, toyed with every now and again with a swatch when some new yarn arrived, but I’ve finally settled on a design and got underway with my dream blanket. It started with over 300 stitches in an i-cord cast on, and I just know it’s going to be a labour of love. I made sure to take this along to June’s knitting club so I could get in some much-needed rows, and I’m actually rather proud to be nearing the end of my third ball of yarn after such a short time. There are, however, seventeen balls to go, and lots of other projects to knit, too! This past week or so, I’ve been on a mad mission to address my yarn stash, and to work it down. 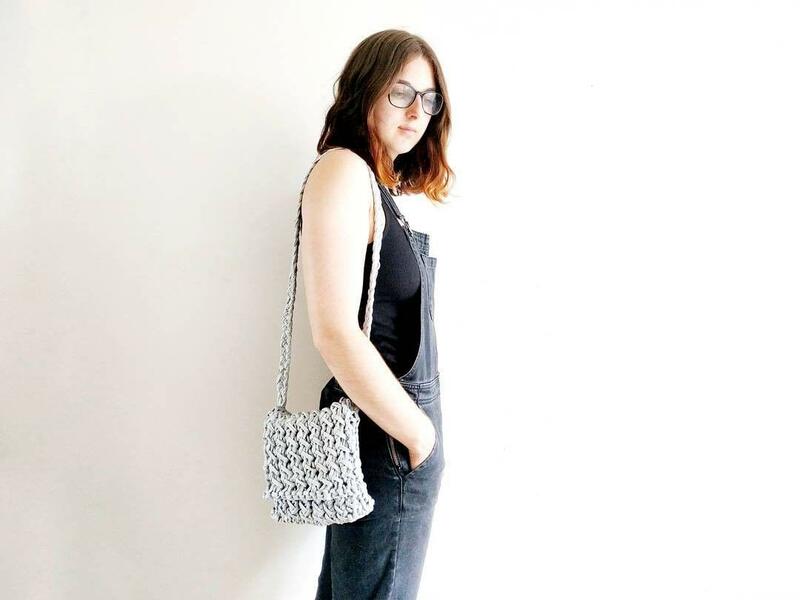 I live in a little one bedroom house, and space is pretty scarce and valuable, so I’m hoping to be more minimalist in my knitting, like I’m trying to be in other areas of my life. Like all good things, if I’m wanting something done, then I want it done properly, so I drafted a spreadsheet to log my yarns, quantities and assign each one a pattern or improv project. It suits me so well to lay things out methodically like this, and now I’ve got a great list to work from to get me to where I want to be. 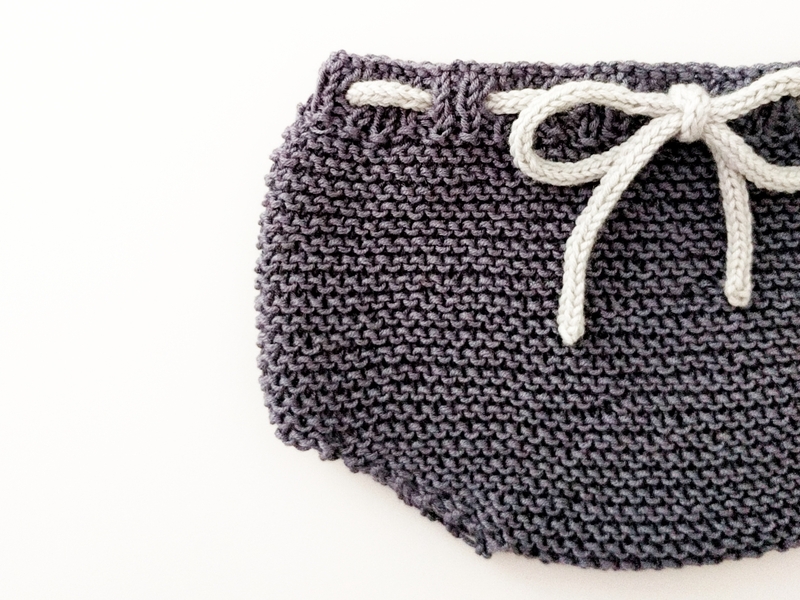 In doing this, I’ve already worked up a little facecloth in my leftover Cotton Denim DK, a pair of baby bloomers from some gorgeous bamboo yarn I had lying around, and another adorable pair of baby socks with some contrasting odds and ends. It’s so exciting for me to see my yarn stash whittling down, while creating plenty of beautiful items for myself and my loved ones. I’ve also been super aware of my yarn buying habits throughout this whole process. I’m very much a bulk yarn buyer, getting my hands on the good stuff and worrying about what to make with it later, but I’ve learnt that that really doesn’t suit me. Instead, I want to find the patterns I just fall in love with, and get the perfect yarn from there, so I’m only creating beautiful pieces with longevity, which really fit my personal style. In attempt to fuel my inspiration and to motivate me to knit through my current stash more quickly, I spent hours at the weekend on Ravelry, bookmarking tonnes of amazing patterns that I just can’t wait to get on my needles. 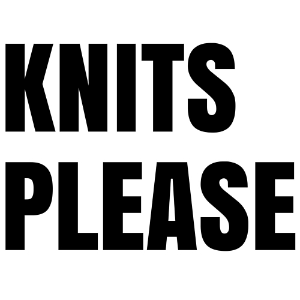 I’ve also made it my mission to find more knitting designers on Instagram, so if you’ve got any suggestions of who I should follow, please send them over! Phew! That was a pretty long update, wasn’t it? If you’ve made it this far, thank you! I really appreciate you sticking with me! I’m hoping to make this here a regular thing, because it’s nice to keep a record of what you’ve achieved instead of always looking at the unchecked boxes on the to-do list, isn’t it? So, now it’s your turn to share! What have you guys been up to in June? I recently finished two pullovers and since them my knitting just got very slow.. I think I’ve done a sock and a half in June. 😆 but in July there will be Jyväskylä knit festival so I’ll definitely get inspired!